In the closing months of 2016, an unassuming hillside community from County Derry found itself thrust into the media spotlight across the island. agendaNi reports. Located in the rural tranquillity of south Derry, between the villages of Swatragh to the north and Maghera to the south, lies the townland of Slaughtneil (Sleacht Néill). Scattered amongst its patchwork fields and web of back roads at the foot of Carntogher Mountain on the edge of the Sperrins, the families which inhabit this particular region of the North West, numbering less than 300, are bound by a deep sense of community and identity. Without a parish or a pub, the local community flourishes around a central nucleus. Robert Emmett’s Gaelic Athletic Club is the epicentre of local life. For any club to successfully field dual-code senior panels is a momentous challenge. 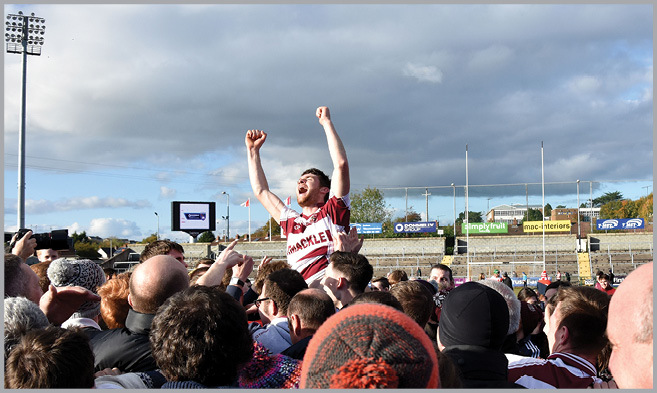 However, in 2016, Slaughtneil’s men and women propelled themselves and their club beyond this and into the pantheons of GAA history by securing a third simultaneous Ulster senior club title – one each in camogie, hurling and football. Upon lifting the Séamus McFerran cup and completing this unrivalled treble, it was notable that the term ‘community’ was core to any reference of victory. However, this particular population boasts more than a now renowned sporting prowess. the development of an IT-training suite, with free community access. In addition to this, the association purchased around 130 acres of one of the few remaining segments of an ancient woodland that once covered most of mid-Ulster, creating the Drumnaph Community Nature Reserve as an amenity for its surrounding inhabitants. A total site of 215 acres is jointly managed by the local community alongside Woodland Trust, which owns the balance of the acreage. This ensures local access to biodiversity and habitat that was once commonplace across the island but has been largely lost due to intensive farming practices. On a clear day, Carntogher Mountain itself, situated above the Glenshane Pass, boasts impressive panoramic views across much of Ulster’s mountain ranges including the hills of Donegal, the Mournes and the Ring of Gullion. Gaeilge, the Irish language, has underwent an enormous revival in the surrounding region. The 1901 census records approximately 50 per cent of local community as having been Irish-speaking. However, by the 1950s only a handful of Gaelgeoirí remained. Despite this, the revival has ensured that bilingualism retains a strong foothold on the Carntogher mountainside and Slaughtneil is the only community on the island, outside of the Gaeltachtaí in which the majority of primary school children receive their education through the immersive Irish medium sector at St Brigid’s Primary School Tirkane/Bunscoil Naomh Bríd. Given this context, the Community Association has expressed an ambition to officially establish the area as a modern Gaeltacht with the language strategy for the area laid out in The Way Forward. The innovative club framework in Slaughtneil, alongside wider community structures and an overarching vision, form a symbiotic relationship which serves to create an almost unique level of social cohesion. This complex connection enables the rural Derry community to pull together to ensure the achievements such as those exemplified by its men and women on the sporting field.